Any fisherman can choose tackle for particular fishing shop. Fortunately, there a wide range of necessary equipment. However, the ability to buy an expensive spinning is not for everyone. If you're new to fishing and have not yet got a permanent "tool", try to make a primitive homemade bait. With it, you can spend many pleasant hours on the beach and to hunt for ruffs, perch, roach and Pescarolo. It is best to prepare the rod ahead of time, cut the tree whip back in the fall – at this time the wood is special durable. Suitable durable and resilient birch, maple, cherry and towering mountain ash shoots with a length of approximately 1.8 m. the Short rod you will not cast far enough, with too long tackle, it will be difficult to follow the float and pull the catch. Shoots trees choose smooth, correct conical shape. Cut off from escape twigs and hang it from the bottom end to the glassed-in loggia or in the barn, in the attic. On the other end attach a load, such as dumbbells. In the spring you need to pare down the whip with a knife, completely removing the bark. Walk the wood is large, and then smaller sticks. You need to make a homemade bait of a strong and moisture proof by treating the whip with vegetable oil. After complete drying of the wood need to be covered with linseed oil, then varnish it in 1-2 layers. Some craftsmen pour the bait rubber, so it could withstand the weight of a heavy fish. This can be done at home. Dissolve in pure acetone pieces of rubber to obtain a viscous mass, and apply this "primer" on the rod. Half an hour later repeat the procedure. Effect will increase if the solution is to add also a bit of plastic. Equip the fishing rod ready with motoviltse (a device for attaching fishing line and winder). If you do not have such equipment, make the top edge of the slit-like cut, tightly wrap it in fishing line and tie a strong knot. To put such a simple rope, hooking the hook over the top winding; a forest should be about 20-30 cm long whip. 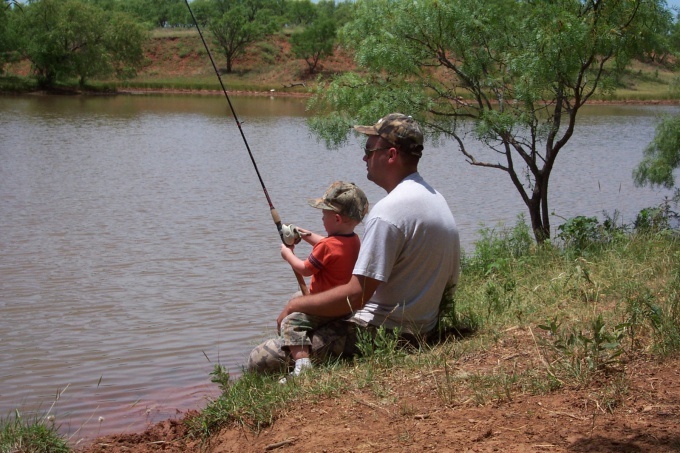 Attach the fishing line to the bobber, sinker and hook. It is necessary to adhere to some basic rules. • The float should be of such form to stand in the water vertically. You can buy it at the store or make your own out of the stem of a large feather of a goose or duck. Clean out the fluff, fold the tip and attach the line for him. For the weight firmly pull the feather ring made of rubber or wood bark. Paint the float in a bright, conspicuous color. Homemade fishing poles are also suitable product from the pen or crafted from foam. • Anchor fasten 12 cm from the hook. If you do not have the purchase of equipment, fit a small nut. • The hook. The most universal are considered forged products, with a straight tip and a rounded bend. When bending a good hook should cpuinit and to take its original shape. In the course of special products №№3-8. Fasten the hook on the end of the line durable knot - a homemade fishing pole ready! Before you make the bait with your hands, check the whips of strength. Experienced fishermen consider that the fishing-rod, unable to withstand the weight of 300 g can be considered suitable for fishing. Try the wood escape, hanging it on the end of different goods. In order not to lose fishing tackle, cut several whips in store.